The 150,000 spectators at the Goodwood Festival of Speed were treated to an amazing sight as an extraordinary array of over 30 supercars kicked off the 2009 Goodwood Festival of Speed. Amongst them were the Trident Marque’s two latest additions: the GranTurismo S Automatic and the Quattroporte Sport GTS, both at their UK debut. Celebrity Chef and car collector James Martin was first on the start line behind the wheel of a GranTurismo S Automatic on Friday. The new Maserati GranTurismo S Automatic features a 4.7 litre V8 which develops 440HP, 490Nm of torque and reaches 62mph from standstill in five seconds flat. Pink Floyd drummer Nick Mason drove the latest incarnation of Maserati’s iconic flagship saloon, the Quattroporte Sport GTS. 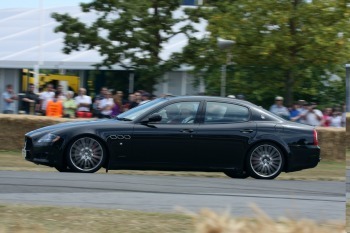 Conceived and developed as “a real driving machine in the guise of a luxury saloon”, the Quattroporte Sport GT S features the new V8 4.7 litre engine with increased power output (440HP), specific gear-shifting software, front and rear suspension with single-rate dampers, stiffer springs and lower ride height. Its sports exhaust, controlled by pneumatic valves and enhanced by large twin-oval tailpipes, accounts for its deep, throaty and captivating sound which enthralled the Goodwood crowd. 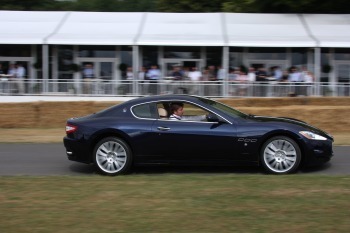 Prices start at £84,395 for the Maserati GranTurismo S Automatic and £89,865 for the Quattroporte Sport GTS.